A Missouri youth baseball team will move forward with an AR-15 raffle following the Parkland school shooting last week. The third-graders will move ahead with the raffle despite criticism. 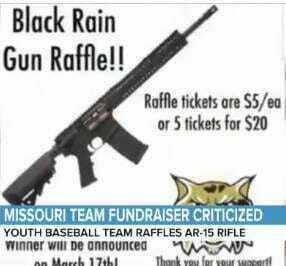 A Missouri youth baseball team is moving ahead with a raffle of an AR-15 rifle despite criticism it received after a similar gun was used to kill 17 in a Florida high school. Coach Levi Patterson told The Kansas City Star the fundraiser for the third-grade team in Neosho, Missouri, had been planned before last week’s shooting in Parkland, Florida. The weapon was offered by a player’s father who is a co-founder of a local gun store. The winner must pass a background check. Patterson has been criticized on Facebook, The Star reported. One commenter asked if he is tone deaf. Patterson responded, “gun raffles have been going on for years. Evil has and will always exist.